Are you using async API? Blocking API doesn't works on some platforms. So please always use async APIs. Hi, thank you for your response! I have 2 scenes. In my first scene, i have a different KiiInitializer. The login and registration works perfectly. When i switch to the other scene, I run a different KiiInitializer and the login gets stuck. Do i need to use Async for this too? I see. It seems you're already using right Async APIs. There's a an article in our document about the multiple scenes. Cool! Thank you for this. Good day! I've reviewed my project and realized that the scripts malfunction when I changed scenes regardless if it's on the Mac or Windoes or iOS device. Is it possibly because I'm calling 2 different KiiInitializer scripts (one for each scene)? Like, for the first scene, I'm calling Initializer A and when i go the second scene, i call initializer B? Because when I run scene B directly and try to login, it works but when i run scene A then go to scene B, it gets stuck in the loading part when I try to log in. Here's a simple example I've tested. In scene1, I've attached KiiInitializeBehavior script to MainCamera in scene1. And filled AppID, App Key, Site in the form. In this application, Scene2 is loaded from the script in scene1. 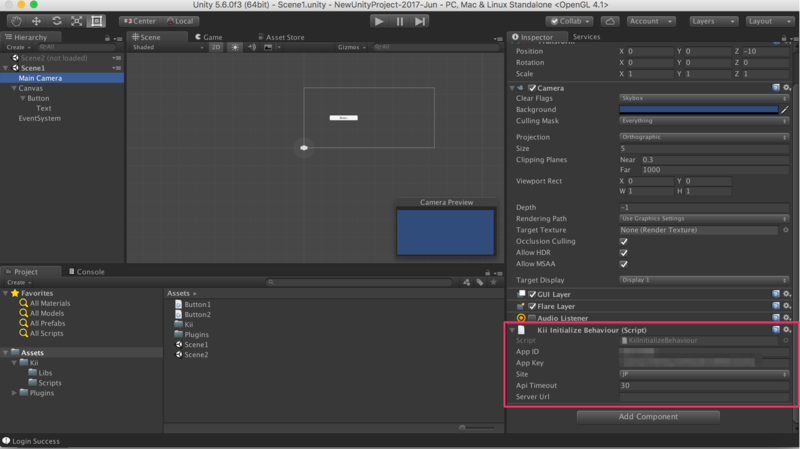 Since the SDK has already been initialized, you can use SDK APIs in the scripts in scene2. No need to initialize the SDK again.